This year marks the 35th anniversary of Volvo’s introduction of the Integral Sleeper, the first North American conventional truck model to offer a modern, streamlined design and a fully integrated sleeper compartment. Aerodynamic design directly affects fuel efficiency, reducing fuel costs for trucking companies, and reducing greenhouse gases. Environmental care has long been a Volvo core value, a position formalized at the 1972 United Nations Conference on the Human Environment, long before care for the environment became a trendy mainstream corporate aspiration. "Pioneering innovations in design, fuel efficiency, driver productivity and safety have defined Volvo Trucks throughout our 90-year history," said Magnus Koeck, Volvo Trucks North America vice president, marketing and brand management. "We're proud of our heritage and celebrate 35 years of aerodynamic design. With the Integral Sleeper model we truly introduced a new standard and all manufacturers quickly followed suit, a trend we continue to see today with automated manual transmissions, greater integration of connectivity services to help maximize uptime, and right-sizing of engines for improved fuel efficiency and weight savings." The Integral Sleeper was the first modern conventional model to unite the cab and sleeper compartments for improved aerodynamics with seamless body-in-white construction that also allowed easy pass-through from the driving environment to the living space. The redefined truck design further defied industry-wide design conventions of the time, introducing a hood that was six inches narrower and six inches lower at the front than at the cowl, to help reduce wind resistance. Integral Sleeper aerodynamics were further boosted through a full-height roof fairing, cab side extenders, chassis fairings and trim tabs that helped air flow smoothly from the tractor to the trailer. "Over the past year we've introduced the new Volvo VNR regional haul, Volvo VNL long-haul, and Volvo VNL heavy-haul tractors under the theme "The Shape of Trucks to Come," which also would have been very appropriate during the 1983 introduction of the Integral Sleeper, a model that inspired a design revolution for conventional model trucks," said Koeck. 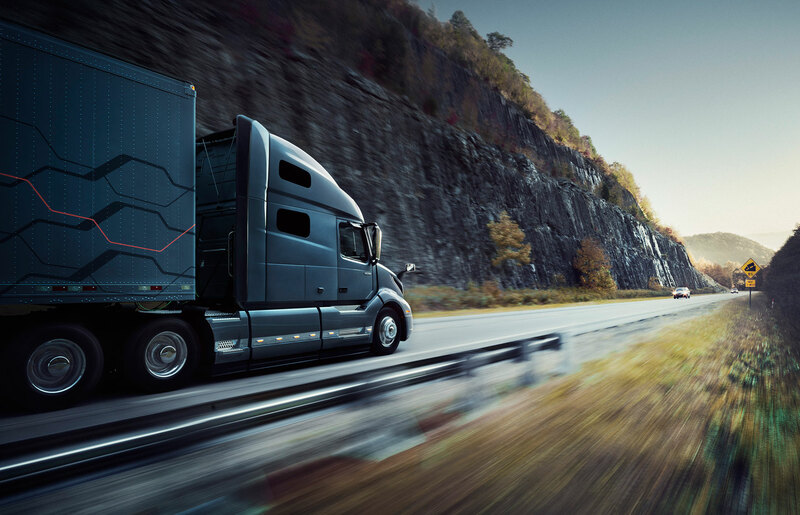 "Each of our on-highway models, the new VNR, VNL, and VNX, bring efficiency through their streamlined shapes. Even regional haul and heavy-haul trucks spend time at highway speeds when aerodynamics become increasingly important." To complement its legendary cabs, made with high strength steel, Volvo, inventors of the three-point safety belt, became the first Class 8 truck brand in North America to designate a steering wheel-mounted driver's side airbag as standard equipment. As active safety technologies mature Volvo has maintained a leadership role, introducing Volvo Enhanced Stability Technology (VEST), an enhanced stability system, as standard equipment for its on-highway lineup in 2007. "Volvo aspires to zero crashes and zero injuries, helping protect drivers and all road users," said Johan Agebrand, director of product marketing for Volvo Trucks North America. "Our global Zero Accident Vision is about helping improve safety, and mitigating these events also presents a tremendous cost savings to truck owners." Once again ahead of the market, Volvo's July 2017 introduction of the new VNL model also brought Volvo Active Driver Assist featuring Bendix Wingman Fusion as a standard offering, making Volvo Trucks the first heavy-duty truck OEM to offer the active safety system as standard equipment, a designation also applied to the new Volvo VNR series. The system is also integrated with VEST to help drivers avoid rollover, jackknife, and loss-of-control situations on dry, wet, snow- and ice-covered roadways. Like the conventional model design change sparked by the Integral Sleeper, Volvo also ushered in a shift in transmission preference in North America. First to market in North America with a proprietary automated manual transmission (AMT), Volvo paved the way for AMTs to receive wide acceptance. In just over a decade since its North American introduction the Volvo I-Shift is now spec'd in more than 90 percent of all trucks built for the market and is standard across the Volvo VNR, VNL, VNX, VHD and VAH product range. "While we still offer manual transmissions, it's increasingly difficult to justify their use, even for the most demanding jobs," said John Moore, Volvo Trucks North America product marketing manager – powertrain. "We truly have an I-Shift for every application, whether it's regional, long-haul, or even heavy loads with our 14-speed I-Shift with Crawler Gears supporting gross weights up to 225,000 lbs. Regardless of the application, the I-Shift consistently performs at its best, whether it is two hours or ten hours into a job." Remote Programming, which helps improve uptime and vehicle efficiency, while reducing downtime costs. "We're in an exciting period when it comes to truck technology, and the speed of change is only accelerating," said Agebrand. "It's easy to get caught up in the technology revolution, but we must keep in mind the industry's journey and the transformative designs and innovations that will continue to sculpt the shape of trucks to come." • Volvo Trucks to Demonstrate Volvo VNR Electric Models in 2019 and Commercialize in 2020 Volvo Trucks announced on December 11th, 2018 that it will introduce all-electric Volvo VNR regional-haul demonstrators in California next year, operating in distribution, regional-haul and drayage operations. Sales of the VNR Electric in North America will begin in 2020. • All-new Loadlink Puts it all under One Hood TransCore Link Logistics Closes Loop with New Single-Platform Loadlink Service. • How to Control Fuel Cost: Fleet Cards vs. Credit Cards. With diesel prices back on the rise, now more than ever fleet managers have to monitor fuel spending. • Volvo Trucks Celebrates 35 Years of Innovation and Aerodynamic Truck Design in North America This year marks the 35th anniversary of Volvo's introduction of the Integral Sleeper, the first North American conventional truck model to offer a modern, streamlined design and a fully integrated sleeper compartment.